The Brit Awards tonight in London will once again be providing a political platform for musicians with a cause. The 1999 festivities will be launching a "Drop the Debt" campaign intended to pressure wealthy nations to forgive the debts of third world countries. While no one's expecting a repeat of last year's incident (that saw Chumbawamba's Danbert Nobacon dump of a bucket of ice-water on a high-ranking British politician, or the previous year's disruption of Michael Jackson courtesy of Pulp's Jarvis Cocker,) the campaign looks like it will be prominently featured at the Brits -- the British equivalent of the Grammys. 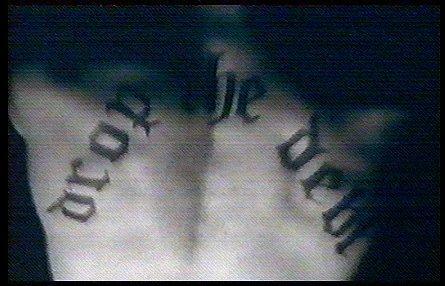 Prodigy frontman Keith Flint is said to be sporting a new tattoo across his back that reads "Drop The Debt. " He already has the word "Inflicted" across his stomach in gothic script, but apparently this is the only such decoration on his flip side. On the official front, the Brits will see U2's Bono on stage honoring boxer Muhammad Ali, who is being appointed International Ambassador by Jubilee 2000, the Drop the Debt campaign's organizers. According to material published by Jubilee 2000, Bono has been a strong supporter since the effort got underway a year ago. Jubilee 2000 also lists David Bowie, The Prodigy, Catatonia, Annie Lennox, Dave Stewart, Cornershop, Placebo, Beck, Robbie Williams, PJ Harvey and Peter Gabriel as among its supporters. Artists have signed petitions, and those attending tonight's awards event are being encouraged to wear badges. The pressure group maintains that monies which should be going to feed hungry children in very poor nations is instead going to back to wealthy countries in the form of loan repayments, loans which for the most part are beyond the nations' abilities to repay, anyway. Jubilee 2000 hopes to see debts of close to $11 billion wiped off third world books by the end of the year 2000.